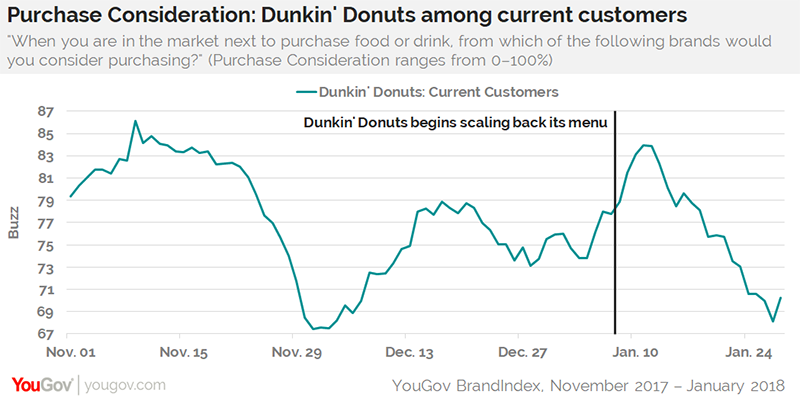 More than three weeks after Dunkin’ Donuts began scaling back its menu, the general public seems to like the concept, but current customers don’t appear to be happy, according to YouGov BrandIndex. Even though the menu changes will be slowly rolled out through the end of March, the early reception is not particularly favorable if it leads to current customers spending less at Dunkin’ Donuts while the general population doesn’t alter their consumption habits. The data from two key metrics shows a stark difference between the general public and current Dunkin’ Donuts customers. The first metric, Buzz, asks respondents: "If you've heard anything about the brand in the last two weeks, through advertising, news or word of mouth, was it positive or negative?" A score can range from -100 to 100 with a zero score equaling a neutral position. 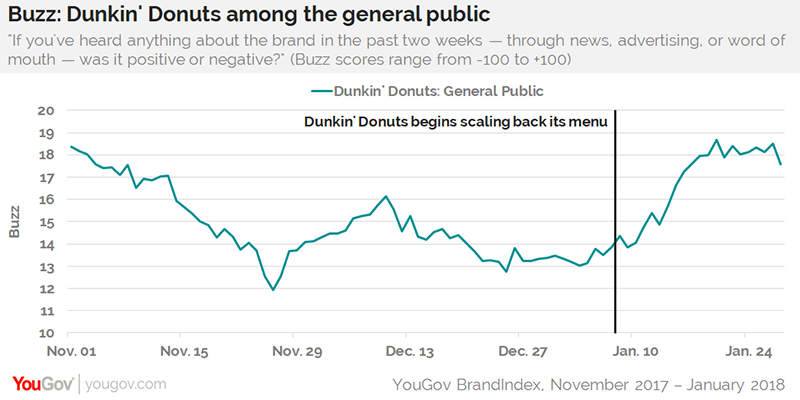 For the general population, Dunkin’ Donuts’ Buzz score climbed modestly from 14 to 18 when the menu cuts began to go into effect in early January. 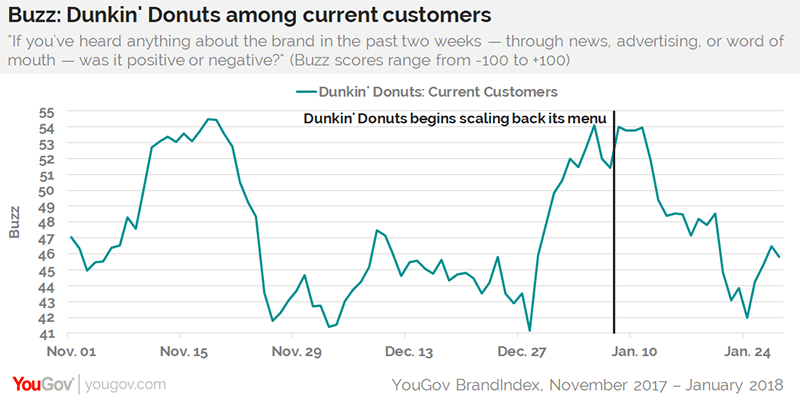 However, the Buzz score for current Dunkin’ Donuts customers dropped from 54 to 42. The Purchase Consideration metric is the more potentially worrisome of the two measurements. For the general population, things have very much remained unchanged: about 29% of all adults 18 and over would consider buying Dunkin’ Donuts the next time they were up for dining at a specialty restaurant. However, for current customers, Purchase Consideration is down by 16 percentage points, from 84% to 68%.